How popular? His 91 novels have sold over 300 million copies worldwide. He also wrote nearly 400 short stories, articles, screenplays, and poems over the course of a 50-year career that culminated in both a National Book Award (in 1979) and a Presidential Medal of Freedom (in 1984.) Not bad for a North Dakota farm boy who’d spent his young adulthood toiling in mills and mines, sometimes hoboing and prizefighting, before crisscrossing the world as a merchant seaman. Louis captured this vagabond lifestyle in stories of action and adventure that he sold to the pulp magazines of the ‘30s and ‘40s. It was only after World War II, in which he’d served as an Army first lieutenant, that he finally found his stride as an author of Western novels. And the rest, as they say, is history. Here, then, is where Lost Treasures earns its keep, affording readers a glimpse of the stories Louis yearned to publish if only the marketplace, or his apprehension of it, had allowed. The book’s 21 chapters consist mainly of stories begun but never finished, running the gamut from supernatural horror to hardboiled noir, from high adventure to classic Western. They include deep-dive historical fiction, and Byzantine intrigues, and even meditations on reincarnation. And Beau sets the table for each chapter with historical or biographical notes that join each entry seamlessly to its neighbor. 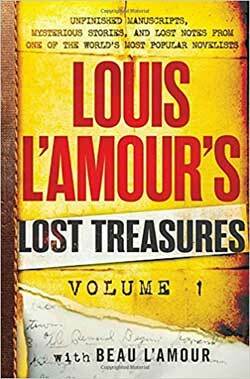 As its title suggests, Louis L’Amour’s Lost Treasures, Vol. 1 ($28, from Bantam) is the first of two such planned volumes. It’s also the start of an ambitious program to re-issue the entire L’Amour canon in special mass-market paperback editions accompanied by Beau’s postscript commentaries. “Lost Treasures grew out of the material I was organizing for a much more comprehensive Louis L’Amour biography,” Beau told me from his home in Los Angeles. “I have always wanted to make Dad’s papers available to the public rather than allowing them to be locked up in a library somewhere, accessible only to scholars.” The result, I’m happy to report, is a compelling, insightful, and instructive look at the life and legacy of an American literary icon. Four Corners bonus: To learn more about this book, the larger project, and the men behind both, join me in conversation with Beau L’Amour at the Cortez Public Library on Monday, Jan. 8 at 6 p.m. I promise that if that dialogue proves half as entertaining as the book, it will make for a night to remember. From January 2018, Prose and Cons.